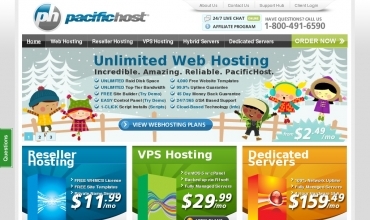 PacificHost has been a prominent player in the web hosting realm for quite some time. Since 1999, they've carved out a niche in the market that addresses the needs of individual users as well as small and medium businesses -- and even some Fortune 500 companies -- with their tri-level hosting option. They utilize five data centers from coast to coast, each protected with 24/7 security in climate controlled facilities with top tier hardware and multiple power backup systems. And their customer support is based in the US. The awards have been many and they continue to pile up, as PacificHost continues to do what they do best. I am pleased to be with this host, they take care of me, not many problems. You should take a look at them. I am experiencing no real issues from these folks, they are pretty good at taking care of business. For a time there were quite a few issues but that seems to have smoothed out so I'm good to go. Am holding on for now as the support seems to be taking a turn for the better. I'm not sure I can recommend them for anyone searching for a new host though. Pacifichost is ok, not the best but they are sufficient for what I need. Support can be iffy at times. Going good for me here, have been with them a while and haven't had many problems. My work here is simple but still they have to perform, and I really have no major complaints. These people have had good moments but they are struggling a bit, don't know if it's a temporary thing or what. In the past all has been okay but there must be some transition happening now. This hosting provider is a joke and I say that lightly. My site goes down from time and time again due to hiccups in the server, the support is an extreme joke! 15 out of 23 times I have had problems which I Can document. This is a terrible service and don't support them please. No major issues here, so I am pleased with that. When there have been a problem then they have gotten back to the ticket in a reasonable time. Try them if you are searching for a host now. They worked well for me going on 2 years now. When I did need support, it was forthcoming. It does seem like they care that they are doing a good job when you have an issue with something. I believe it is more important to pay a little more and get the service that is important to you. They have been okay, not overwhelmingly great but a fairly solid performace. Sometimes getting in touch with them can take a while, so the response lags but generally they are back in touch with you in a reasonable time. i get tired as heck of wordpress going down. I was not planning on using the site that i set up for a whole lot of traffic, so i did not want to pay very much. The price was OK for that. I did have to send in a help ticket about my SSL cert not installing right. According to them i just had to follow thier specific directions but these were not proper for what i was trying to do. Too many issues and then not enough support when i need it. These people are not perfect but no hosting site is IMO. But they have taken care of me to my satisfaction so think I will stay with them for the time being. The issues have been taken care of properly when they have arisen. I have had my website for over ten years, and during that time I have had about half a dozen servers. In June 2010, I transferred my website to a VPS on PacificHost. I cannot begin to tell you of the problems that I had with them. I would stay as far away from them as possible. Although their customer services was friendly and helpful, the issues that I have experienced are to much for my liking. I've used Pacifichost for quite a long period of time. Most of the traffic stems from a webcam which uploads several pics per minute. Reliability is 100% I honestly cannot remember the last downtime our site has had that wasnt because of something I did. The server uptime and overall speed performance are outstanding and consistent. Their technical support is Helpful - support tickets tend to get a response within minutes, which usually resolves the problem. I'd recommend them quite highly. PhpHosts provided great info for my hosting research.